The Worcestershire Pear Tree is to be the subject of a major landmark sculpture, which is intended to be sited beside the County's chief motorway, the M5. It will stand 21 metres high and be of steel construction. One metre higher than the Angel of the North. The model has been approved and preparations are in hand. The black pear is the historic symbol of the County and is depicted on the County’s Coat of Arms and that of the City of Worcester. Legend has it that in 1575 Queen Elizabeth 1, visiting, was so delighted at the sight of a laden pear tree at the gate to the City that she ordered the City elders to add three black pears to their coat of arms. This towering sculpture will express and re-enforce a sense of local pride and identity. Such a landmark will also contribute to the County's promotion of tourism and industry. It will be a County statement about the engineering traditions of North Worcestershire and the rural economy of the south, and it will stand proud. In the current economic climate it is a necessary statement of confidence in the working skills of our community. Throughout history art forms have played an important part in expressing the resilient human spirit. The sculpture will speak to those whose daily work takes them up and down our work corridor. And those just travelling through will know that this is proud Worcestershire. The Pear Tree will become an iconic image for Worcestershire. Such a communities project requires very wide consultation. Conversations have been taking place with the County Council heads of departments, Worcester College, H&W Chamber of Commerce, engineers and many others. . We are heartened and encouraged by their response and help. The promotion group, which is applying for Charity Status, first met in September 2010. The Chairman is Canon Bill Richards. It has received great encouragement from every quarter. Worcester College has done some fine promotional work. Individual Worcestershire companies have donated their time and skills towards the project's success. The WPT Committee is extremely grateful to all these people. Without their help such progress could not have been achieved. The success of the Angel of the North is instructive. At first it was considered a quirky idea. Now it has won the hearts of northerners and it boosts their economy. 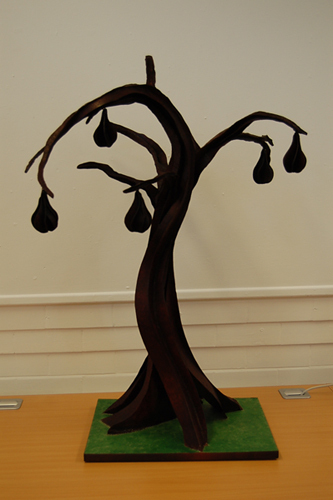 The Worcestershire Pear Tree Foundation Ltd believes that Worcestershire will be no less proud of this iconic sculpture. The Foundation will be investigating raising ongoing funds from the visitors to the pear tree site and by funds raised from the leasing of the branding of the Tree Sculpture to industry. This will not only cover the maintenance of the Sculpture but will help to fund the ongoing development of Apprenticeships within our county. A few preliminary specifications: The height of the sculpture…………………………21metres The widest section will have a span of…………. 17 metres The foundations will be approximately… 280 cubic metres The sculpture will be made from Core 10 steel plate The Tree is expected to weigh approximately…230 metric tons. The cost of the structure is likely to be in the region of £1.5 Million. Though this is very much an estimate until the structural analysis has been completed. The 21 metre high sculpture will stand on a foundation for use as a promenade area. The railings surrounding the promenade area will have rosettes cast into the handrails to represent members of the armed forces of our county that gave their lives for us since 1914. There will be panels set into the railings from primary schools in Worcestershire designed collectively by the students and teachers. The schools will be asked to take part in creating a depiction of what Worcestershire represents to them. 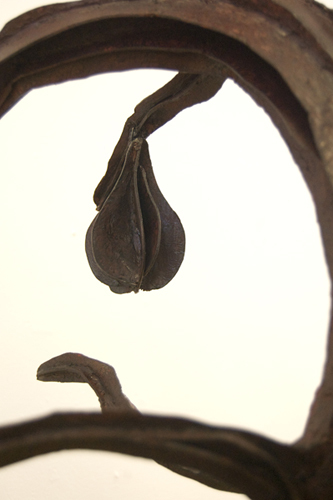 Under the guidance of Antony Poels the designs will be replicated in Wax and cast in metal.